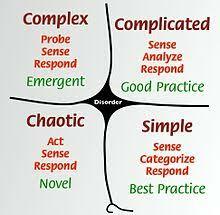 Recently, I published a blog for Catalysis around adaptive problem solving. As we think about problems, we need to sense the type of problem to utilize the right method of problem solving. Most problem solving is in the simple and complicated domains: for many community problems we must embrace the methods around complex problems. Check out the link here! Are you using the right tool to solve your problem?